Two rescued dogs are grateful to DVGRR for saving their lives. 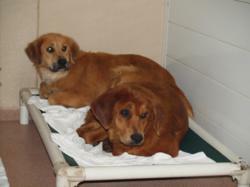 Six retrievers in a shelter were scheduled to be euthanized in mere days. Another 17 dogs were living in a house in conditions described as “pretty frightful.” DVGRR’s response was immediate: “We said we’d take them all,” says Adams. This is a tale that brought outpourings of support and concern, galvanized a team of staff, board members and volunteers, brought 20 endangered golden retrievers and other canines from North Carolina to safety and care—all in the course of two hectic, grueling days. It was, for Delaware Valley Golden Retriever Rescue (DVGRR), part of a normal week. Within hours, four vans were rented, eight drivers were recruited and every available or borrowed animal crate was loaded, all in preparation for a 4:00 a.m. departure the next morning. By noon, the DVGRR team had arrived to begin a very challenging rescue. “Our major issue now is financial,” says Adams. “The cost of this rescue was formidable, and the health challenges and veterinary needs of these dogs will be huge.” She requests that anyone interested in donating to assist the North Carolina rescue dogs visit http://dvgrr.org/donate or call (717) 484-4799. For those interested in adopting any of the Goldens, Adams recommends checking the website regularly for status updates. Since 1993, Delaware Valley Golden Retriever Rescue has successfully placed over 2,300 Golden Retrievers throughout Eastern Pennsylvania and New Jersey. DVGRR is a 501 (c)(3) non-profit organization that relies on donations, its supporters, fundraising, and the proceeds of its online store and on-site retail store, Pap’s Place, for funding. Visit DVGRR at http://www.dvgrr.org or follow them on Facebook at http://www.facebook.com/DVGRR.